ASIA NEWS Report: A 71-year-old Australian nun and well-known human rights activist, who has been in the country for 27 years, has been accused of joining anti-government demonstrations. The Catholic Church and activists are now concerned about a government campaign against dissent. Manila (AsiaNews) – "It is a shameful act, a very undemocratic gesture by the government. They should be ashamed because speaking in favour of the poor cannot be a crime," said Fr Edwin A. Gariguez, head of the National Secretariat for Social Action (NASSA) and Caritas Philippines, the humanitarian agency of the Catholic Bishops’ Conference of the Philippines (CBCP). The clergyman spoke to AsiaNews about Sister Patricia Anne Fox (picture), the 71-year-old Australian nun and human rights activist, who was briefly detained. In his address to the Armed Forces of the Philippines change of command ceremony yesterday, President Rodrigo Duterte took "full responsibility" for the arrest of Sister Patricia, who is the superior of the Our Lady of Sion congregation in the Philippines. The president said he had ordered that the missionary be investigated for "disorderly conduct", on the grounds that she was “undesirable alien” who has no right “to criticise us”. Sister Patricia has been in the country for 27 years and has worked with farmers and indigenous peoples. She recently joined an international fact-finding and solidarity mission that investigated alleged rights abuses against farmers and lumad in Mindanao. The authorities accuse Fox of joining anti-government demonstrations in the cities of Davao and Tagum, both in Mindanao. 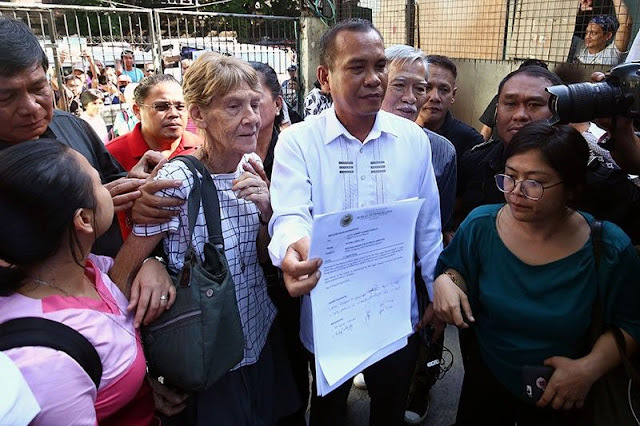 Three days ago, six officials from the Bureau of Immigration removed Sister Patricia from the mission house in Quezon City and took her to the Bureau’s intelligence division in Intramuros, Manila. The nun was released Tuesday afternoon after 22 hours after it was established that she holds a valid missionary visa making her a “properly documented alien”. The Bureau of Immigration said that Fox is not covered by inquest proceedings as the latter will only apply to aliens arrested after being caught in flagrante violating immigration laws. Nevertheless, the missionary will still be under investigation to determine if deportation charges should be filed against her. Under the immigration law, foreigners are barred from joining mass actions or political activity as the act amounts to violating the conditions of their stay in the country. Fox admitted joining demonstrations in solidarity with peasant groups but “not anti-government rallies”. The Catholic Church and human rights activists are concerned that a campaign against dissent lies behind Sister Patricia’s Patricia. Mgr Broderick Pabilllo, auxiliary bishop of Manila, visited the nun at the Bureau of Immigration Monday evening. He explained that "By virtue of her prophetic ministry, the Church is called to be courageous, bold in expressing herself in the name of truth, as well as the rights of the last and the oppressed”. Hence, “we cannot be intimidated by the government. We will carry on our mission and the government can do nothing to stop us ". What is more, "Sister Patricia's arrest goes against the cultural values ​​of the Filipino people. We are a very charitable people towards others and seeing a 71-year-old nun in prison has struck a chord with people. "Sister Patricia's detention is also unacceptable to Duterte's supporters because piety and respect for the elderly are an integral part of our tradition. On social media there have been very harsh reactions, I have read many comments from outraged people.